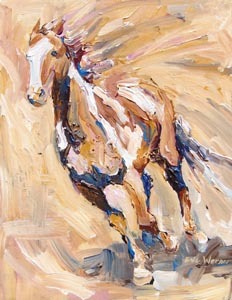 My newest equine paintings continue my exploration of wild horses. In these large-scale paintings, texture, abstraction, and sparse composition evoke the raw, harsh beauty of the landscape that the wild horses of western America inhabit. © 2019 The Art of Eve Werner. All Rights Reserved.